Saturday gone, we had the last of the beers we had that were brewed for Halloween, I suppose the Christmas beers will be out soon. 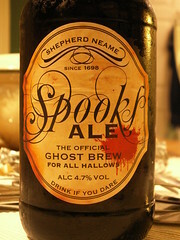 Shepherd Neame, Spooks Ale, from England. 4.7%, deed red colour with a thin head, caramel malt aroma, nice toffee malt taste, not bad.